Here we have this semester’s grades, fresh from the grill. Note that it was, in fact, worth the death-defying, adversity-strewn ride to campus for the Thermo final after all. Also, please note that the unit count reflected below the semester’s grades is a little misleading. Specifically, the part where it says I’ve taken 14 credits “not for GPA” and only managed to pass one of them. What it really means is that I passed the one-credit pass/fail ECE freshman seminar, the grade for which was predicated entirely on showing up, and formally withdrawn from 13 credits’ worth of classes over my career – three for that online Classics class that got munched by the Medical Adventure over the summer (as the Dean’s office did in fact approve my retroactive medical withdrawal from same), and 10 when I left school before the end of the spring 1994 semester to take a job at Leading Edge. 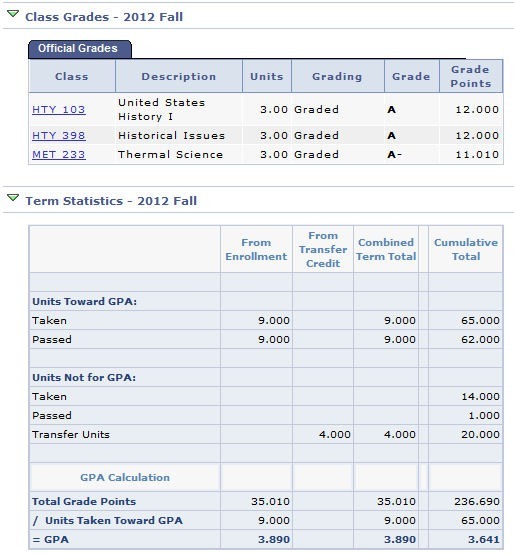 A W grade is recorded on one’s transcript when that happens, but it’s a no-op: no credit, but no harm to GPA either. Basically all it means is that you dropped the class too late to get a refund, but before you would’ve been committing to an F. Withdrawing from those 1994 classes properly instead of just allowing myself to F the semester was just about the only thing I did right that year. Also, transfer credits aren’t figured into GPA, which is a shame since I rocked the house in the physics courses I took off-site last year (the second of which is reflected in the Term Totals here because the transcript didn’t come across until this fall). OTOH, if they counted the handful WPI classes I transferred in for credit, that would hurt, since I don’t think I ever got better than a C during my whole time at WPI, except in one history class UMaine didn’t give me transfer credit for. Anyway! Disaster averted, and the financial aid gods should be satisfied with that; I don’t think there’s anything in my aid package that counts on anything higher than a 3.5 (and most of it’s 3.0). Categories: Documenting the Process, Success and Failure Tags: semester complete, victory! As previously noted, I was a 3/4-time student this semester, because of the ongoing recovery from my summer medical adventure. I took three classes; one was online and did not have a final exam. So, naturally, the finals in the other two – completely unrelated classes in different colleges, one for my MET degree and one for my history degree – ended up scheduled back-to-back on the Wednesday of finals week. Which was today. I should note that it started snowing here in north-central Maine on Monday afternoon… and, apart from occasional periods of sleet and/or freezing rain, which is not a helpful change, it hasn’t stopped yet. For the past two days, the University of Maine has basically been the only school in Penobscot County not closed on account of the weather. I got up this morning and went outside to find that my front walk and car were covered with around a foot of wet, heavy, hard-to-shovel snow. It wasn’t until I’d finished shoveling that lot up, and in the process kicking off an asthma flareup that still hasn’t subsided, that I noticed I had a bigger problem: the man who plows our driveway hadn’t been by yet, and the municipal public works plows had left a three-foot-high wall of packed ice across the end of the driveway that there was no way any of our tools around the house were going to shift. By the time Mom’s husband Vince managed to track down the plow guy and get him to come over and scrape that away, I’d have been running late for my first exam on a normal day, much less on Day 2 of a heavy snowfall. Forty minutes later, I had just about reached the Interstate when my history professor, whose exam was scheduled to begin fairly soon, phoned me to say that I shouldn’t drive down on account of his class if I didn’t think it was safe, and that he’d get with the TA who’s been in charge of the class subsection I’m in and work out another way of handling my final. With an extra couple of hours suddenly added to my schedule and the prospect of possibly not having to make the trip at all, I bought a meat snack and a hot chocolate at the gas station by the Interstate exit and made my way slowly back home, thinking I’d at least have time to get some lunch. I had just about arrived at home when my other professor (Thermal Science), whose exam was set for later in the afternoon, emailed me and cheerfully related that he’d checked his records, and I’d be all set if I chose not to turn up for the final in his class. With my excellent homework record and decent-to-quite-good range of scores on preliminary exams, I’d end up with a C-, easily clearing the minimum requirement to progress on to his Thermal Applications course next semester. Please note that he was not being sarcastic or snide with that. He’s genuinely not bothered about how much you pass his class by, as long as you pass it. With a perfectly aligned engineer’s mindset, he’d crunched the numbers and determined that the outcome would be Acceptable, and he was pleased to let me know that my troubles were over. I like Professor Crosby a lot, but coming from a background where I’d be grounded for a month if I brought home a B in math, I find his mindset on grading a little difficult to get behind; and anyway, I don’t think the financial aid gods would have been quite so sanguine about what that’d do to my GPA, so I scratched lunch from my plans and got ready to go out and do battle with the snow again. It was at this point that Vincent called and insisted that, if I was planning to go back out into the snow, I should take his 4WD pickup truck instead of my poor old Pontiac. Which meant slogging across the yard to Mom’s house for the keys. Note that Mom and Vincent were both at home sick with some kind of Arcturan misery virus today, so naturally this would be the day when, while I stood in their front hall trying to breathe as shallowly as possible (already feeling wheezy in the chest) and thinking dark thoughts about swarming pathogens, they couldn’t find the keys. Protesting that A) I was already going to be late because of this and B) I don’t want bird flu, I tried to leave four or five times, to increasingly plaintive cries of no wait wait I know they’re here somewhere from my mother, before I finally escaped. Then, in the driveway, I thought hmm, I wonder, tried the door of the pickup, and found that it was unlocked and the keys were in the ignition. I believe it was last driven sometime last week. So I shlepped my things across and hit the trail again, feeling marginally more confident. I was about halfway to the Interstate again when I looked down and found that the truck was nearly out of gas. OK, don’t panic, I thought, there’s that full-service gas station in East Millinocket, I’ll fill up there and won’t even have to get out of the truck. Gas station and neighboring credit union signs suddenly dark, town’s one traffic light goes into blinky yellow “the grid has failed me” mode. Zap. I wondered if the power would still be out when I got to Medway, the next and last town before the Interstate. It was. The Citgo station and the Dysart’s one, both dark. Now I have a serious problem developing. I don’t have enough gas to make it to Orono, and the next town down the line from Medway, Lincoln, is miles off the highway via an access road. If the Irving station out by the Interstate (where I had, you may recall, earlier bought a meat snack and a hot chocolate) is out as well, I’m beached. I’ll have to turn around and pick my way back across 157 to Millinocket again, at which point I’ll be so late I might as well not show up at all. Here, at last, the Force was with me a little, because just as I arrived at the Irving station, the power came back on (giving me the interesting sight of the electronic price sign saying that the per-gallon cost of regular unleaded was ERROR). Breathing a sigh of relief, I pulled up, went through the usual procedure, pressed the button to select the grade of gasoline I wanted, and received the message, NETWORK ERROR PLEASE TRY AGAIN. “Oh, the power’s just been out,” said a voice behind me, making me jump slightly. I turned to see the woman I’d bought the meat snack and hot chocolate from earlier, holding a roll of tape and a handful of signs reading CREDIT CARD READERS OUT OF ORDER PLEASE PAY INSIDE. This apparently happens often enough that they already had these signs ready to go. “I don’t have any cash,” I said. Thermo exam scheduled start time: 2:45 PM. Speed limit on Interstate 95 today: 45 MPH. My arrival time in the room where the Thermo exam was happening: 3:15 PM. Prof. Crosby was startled to see me arrive; having told me not to sweat it and that I’d pass the class if I didn’t show, he figured that’d be the end of it. Fortunately, since no one else needed the room after us, he let everyone overrun the scheduled exam end time (5:00) a bit, stretching it out until 5:30. Which was good, because I needed that extra half-hour. I still didn’t quite finish the exam, but with a little help from Our Lady of Partial Credit, I may yet pull a decent score on it – and since I already knew I had a C- without it, anything I manage to score on it will be gravy in a way. As we packed up to leave, Prof. Crosby said, “You’re not going back tonight, are you? Feel free to bunk on one of the couches in the MTL student lounge and head back in the morning if you think it’d be safer. Nobody will bother you in there.” This was mildly tempting, but indeed I was heading back forthwith, because – an email from my history professor which had arrived while I was phone-off for the Thermo exam informed me – my history final was waiting in my inbox at home, for me to complete tonight, on my honor, without reference to the textbook. Which I did when I finally got home around 10. Edited to add: It’s Friday and I have, in fact, got the flu. * By “traffic” I don’t mean gridlock, but rather that it’s a two-lane country road in an area where the mean age is something like, no kidding, 55 – which means one stands a fairly good chance of ending up behind some aged citizen who lacks any sort of sense of urgency, and if you’re thwarted by oncoming traffic at the one or two good places to pass, one can easily end up having to dawdle along at 35 MPH or worse the whole way, even on a perfectly clear, dry summer day. This is unspeakably infuriating when it happens, which, naturally, it tends to do when one is running late. In this case it didn’t happen, but frankly it wouldn’t have mattered if it had, since I don’t think I got about 30 at any time anyway. One of the courses I’m taking this semester is a history course concerning the Revolutionary War as it was fought in and affected the province of Maine (which was part of the Massachusetts Bay Colony at the time, and after the Revolution was part of the state of Massachusetts until 1820). One of the documents we’re using in the course is called the Baxter Manuscripts, and is a compiled transcription of various letters, notes, legal documents etc., mainly pertaining to the provincial assembly of Maine and its communications with the Massachusetts legislature in Watertown. Now that, my friends, is a missive. I particularly enjoy (as does our instructor) the word “younavarcel”. The younavarcel Compaint would make an excellent band title for an American Revolution-themed punk rock band (there must certainly be at least one making the rounds of the historical re-enactment community). 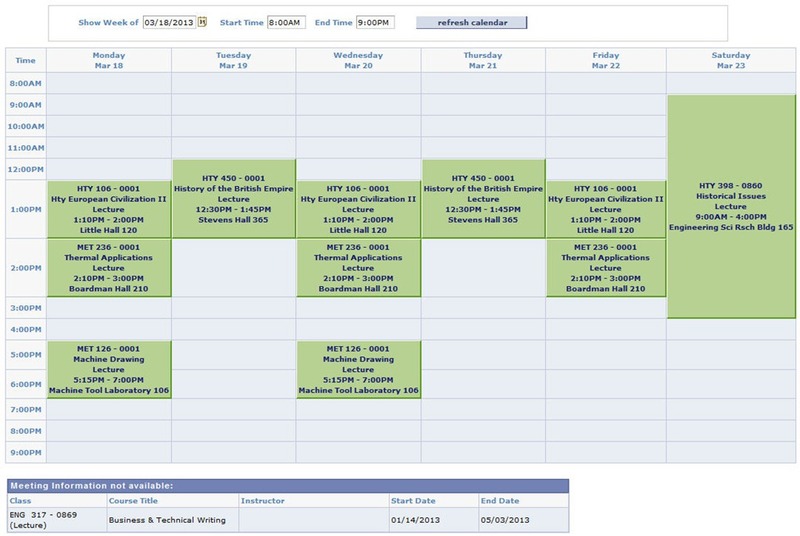 I just registered for my spring classes. I think the schedule I’ve constructed might be a little too ambitious – I’ll be jumping from 9 credits this semester to 18 in the next – but it does have its advantages. Here’s the schedule grid for the week after we get back from Spring Break. Notice the big block off to the right? That’s an odd, odd course; it meets all day Saturday, but only three times over the course of the semester. You may have noticed that the designation shown on the schedule is somewhat less than illuminating. That’s because it’s one of those catchall course designations that can mean different things at different times. I’m taking a course called HTY 398 this semester, too – an online class entitled “Maine in the American Revolution” – but next semester it’s a non-online class that meets on three Saturdays and involves attending a full-weekend conference in Camden in February with the ominous title The Middle East: What Next? Now, I’ll admit right up front that I am not terribly interested in the Middle East barring T.E. Lawrence’s Seven Pillars of Wisdom, but one of the requirements for a history degree at the University of Maine is that you must have taken at least two courses involving the history of some part of the world other than Europe and North America. With the schedule above I’m hitting both of those next semester (“History of the British Empire” counts as one too; Britain is in Europe, or at least next to it, but the Empire was not), as well as clearing off the last of the 100-level courses required (106, the followup to HTY 105, which I took in fall 1993). I also have to admit that I’m awfully tempted to drop HTY 450, despite the fact that it gets the other half of the foreign history requirement out of the way (and that the instructor is my HTY advisor, Professor Miller), because it’s been verrry nice having Tuesday and Thursday off this semester, not only from an oh-God-not-more-driving perspective but also from an oh-God-not-buying-more-gasoline perspective. On the MET side, what I’ve got there is the sequel to this semester’s thermodynamics class; officially they’re “Thermal Science” and “Thermal Applications”, but basically they’re Thermodynamics I and II. MET 126 is also a sequel to a class I’ve had already, but has a new instructor. Not sure what to make of his scheduling choices. Has he got a day job or something? I think the way that and Thermo II are scheduled will keep me out of my work study gig altogether on those days, but on the other hand I’ll be open for both the afternoon and night labs on Tuesday and Thursday, which is a point in favor of not dropping HTY 450. Have to wrap this up right now, as I need to go post a sign at the MTL noting that there is no night lab tonight, then head home and wait for the power to go out. Yes, it’s well past time for an informative post about what’s going on this semester. This, however, is not that post. I just wanted to note something that happened today. One of the classes I’m taking this semester is a very basic introductory U.S. History class, because it’s a degree requirement on the HTY side of my schizoid program. Being a basic class taken by a lot of freshmen, this is held in one of the giant auditorium-style lecture halls in Little Hall. I’ve had several classes in these rooms, but never one quite like this. It’s sort of your classic college Giant Introductory Lecture, where the instructor’s not that bothered about whether people turn up or what they’re doing as long as it doesn’t frighten the horses. I sit up at the back, behind all the stadium seats, at a desk thoughtfully provided by the DSS office; from my perch I can see what all the people in about a third of the auditorium are up to. As you might expect, a lot of them are up to using their laptops for stuff other than paying attention to the lecture. Facebook, sports websites, lolcats, that kind of thing. I usually pay it little mind. It’s no skin off my back if the kids aren’t with the program. Today someone was playing Galaga. Thought we wouldn’t notice… but we did. Here’s something from the online student service thingy. There are two interesting things about this. One is what it says under Start Term – quite ambitious for a campus information system, I should think. The other is that they didn’t do it. 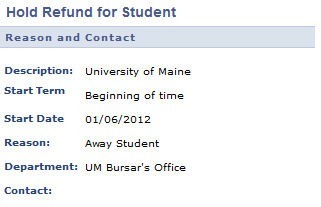 For those of you who remember the excitement at the beginning of last semester, I was informed somewhat after the fact that, since I was taking Physics I at Eastern Maine Community College and thus considered an Away Student, the Bursar’s Office was holding my refund and wouldn’t release it until they’d received proof of enrollment from EMCC – proof that would not be forthcoming, EMCC’s people told me, until the second week of the semester, after their Add/Drop period expired. This led to a bit of a desperate scramble for the first couple weeks of the semester. Well, this semester, I’m taking Physics II at EMCC, and was warned ahead of time (for once) to expect the same dance again. There was some fairly grim hatch-battening going on this last week as a result, I assure you. So imagine my surprise when the aforementioned spring semester refund arrived in the mail this morning. Actually, this was doubly surprising, because A) they insisted last month that it wasn’t ever going to happen and I should prepare to eat ramen and steal other people’s gasoline for the first week or two and B) my driveway is icy, which usually causes the postman to wave off and not bother delivering my mail. I’d call them Monday and ask what the deal is, if I wasn’t 80% sure that would cause a Bureaucratic Correction involving the money somehow being rescinded until later in the month, and, well, no. Not gonna do it; wouldn’t be prudent. Categories: Mysteries of the University Tags: how will the emperor maintain control without the bureaucracy?, wait what?